Rehab and therapy service often comes after an unwelcome surprise. You never know when an accident will happen, or the extent of care that your senior loved one may need after an injury. When Kate Jenks suffered a terrible fall at her home in August, just six days past her 100th birthday, she wasn’t sure she would live to see the holidays. Kate was climbing the stairs at her house in suburban St. Louis when she lost her balance and tumbled backwards down the steps, slamming against a wall. She fractured six bones in her neck and upper back and could have been paralyzed or died from that type of injury. Kate didn’t realize her injury was so serious at first. Although she was battered and bruised, Kate actually got up on her own and made it back up the stairs to call for help. She doesn’t remember much between making that call and waking up in a bed at Bethesda Southgate, a skilled nursing community in South St. Louis County. Bethesda Southgate social worker Jessica Leuthauser said physicians who refer patients to Bethesda’s therapy service weren’t any more optimistic about Kate’s condition. Kate was put on bed rest for six weeks and was forced to wear an uncomfortable “Miami J collar,” a stiff neck brace that not only prevented her from bending her upper back but pushed against her chin and made it difficult to talk or eat. 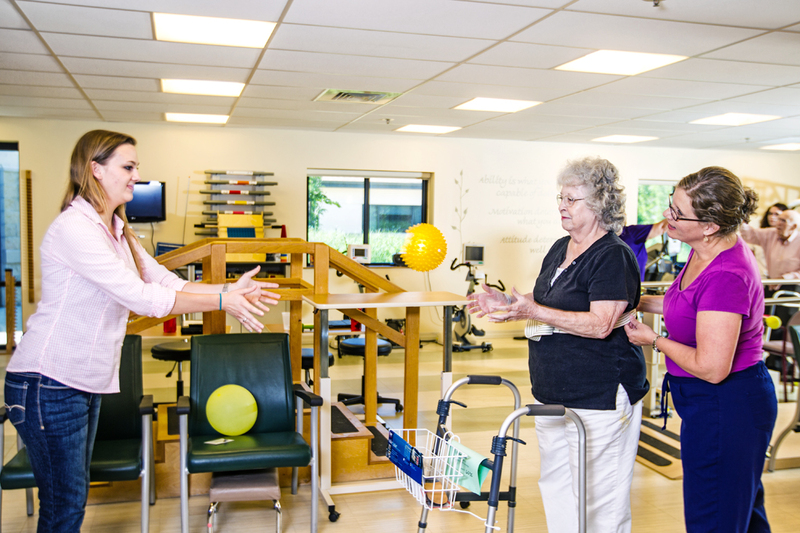 Despite a long road back to “normal,” Bethesda Southgate rehab staff members and Kate’s family worked to put together a plan to rebuild her strength and give her back her ability to take care of herself. Neither Kate nor the therapy service staff at Bethesda Southgate were willing to give up or get frustrated by the challenges that stood in her way. Little by little, Kate was able to make progress. She got stronger every day and eventually had to stop therapy for a while because she improved as much as she could while still wearing the Miami J collar. Kate said she was thrilled when one day, as she ate lunch, a therapist asked her if she was ready to get that collar taken off. She knew she was on her way to a complete recovery. When the collar came off, she began more aggressive rehabilitation that led to her being able to leave the rehab and therapy center. Four days before Christmas, Kate was able to check out of Bethesda Southgate where she spent the previous four months. She was able to stay with her family for a few days and then to return, permanently, to her St. Louis home of 67 years. While it was a long journey to her recovery, Kate said she has been restored to 100 percent. She can do everything on her own now that she could do before her fall. She was in a lot of pain especially at the beginning of her recovery. But Kate said she was never discouraged because of the support of the therapists at Bethesda Southgate. Jessica said Kate has been an amazing patient. Kate said she was able to keep her spirits up because of the support of the Bethesda Southgate therapy service staff. If you or your loved one suffers an injury that requires rehab or therapy, Bethesda has got you covered! Contact us to learn more about our communities that offer Rehab and Therapy Service in the St. Louis area. For more information about Bethesda’s rehab and therapy service, please call 314-277-9959.